CHARLOTTE HARBOR & THE GULF ISLANDS, Fla. (Oct. 07, 2015) – Englewood resident Capt. 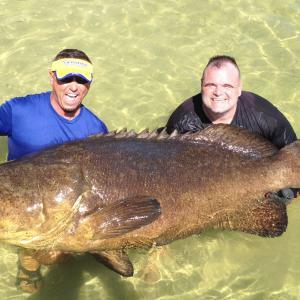 Chris O’Neill of Tail Chaser Charter Services has fished Southwest Florida’s waters for 11 years and has more goliath grouper catches on record than any other angler. His reputation for landing monster catches, which can weigh in at more than 500 pounds, has made him one of the area’s most sought-after fishing guides. Oct. 10, O’Neill will be featured on the Outdoor Channel’s Stihl’s Reel in the Outdoors with Joe Thomas television show. The popular series explores America’s passion for fishing by featuring trips with the country’s top anglers. Through this episode, an estimated 2.5 million viewers will see some of Charlotte Harbor’s world-class fishing. The half-hour show was filmed on Manasota Key in July and includes the Weston’s wannaB inn, which served as the headquarter accommodations during filming, Englewood’s gorgeous scenery, and the exhilarating thrill of landing multiple goliath grouper with Capt. Chris O’Neill. Prior to pursuing his dream of being a professional fishing guide, Capt. Chris O’Neill retired from a 20-year career as a U.S. Army first sergeant. His guide service, Tail Chaser Charter Services, departs from Gasparilla Marina in Placida and offers inshore and offshore fishing trips for various species of fish including tarpon, snook, redfish and goliath grouper. O’Neill has been featured in numerous media outlets and television shows including Army Times, Big Water Adventures, Florida Sportsman, Mark Sosin&apos;s Saltwater Journal, and Majesty Outdoors. He’s the founder and co-host of Southwest Florida’s only live from the water fishing show as well as the Reel Saltwater Outdoors Radio Show, broadcast weekly on WENG. Due to population declines in the 1970s and 1980s, harvesting and possessing goliath grouper in state and federal waters off Florida has been prohibited since 1990. O’Neill spent three years working with the University of Florida preserving and understanding the species. Learn more about Florida’s goliath grouper on the Florida Fish and Wildlife Commission website. When: Saturday, Oct. 10, 7:30 a.m. E.T. and 3 p.m. E.T. Capt. Chris O’Neill is available for interviews.